We have a new breakfast favourite these days and it came from a recent road trip to Cambria. That’s about all there is to do there. 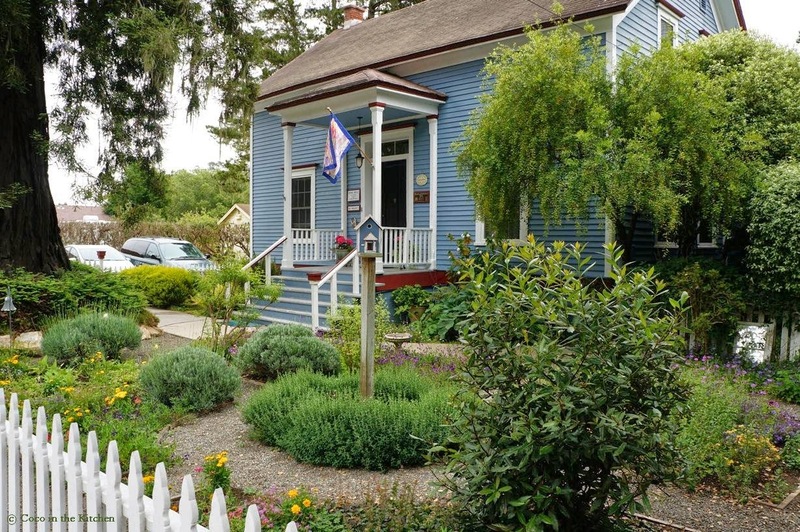 Originally an artists colony, Cambria is, at first glance, nothing more than a one-horse town that spans a couple of blocks. A short drive from the famous Hearst Castle, it’s actually quite the character, playing host to cozy eateries and beautiful Moonstone Beach and quaint B&Bs. 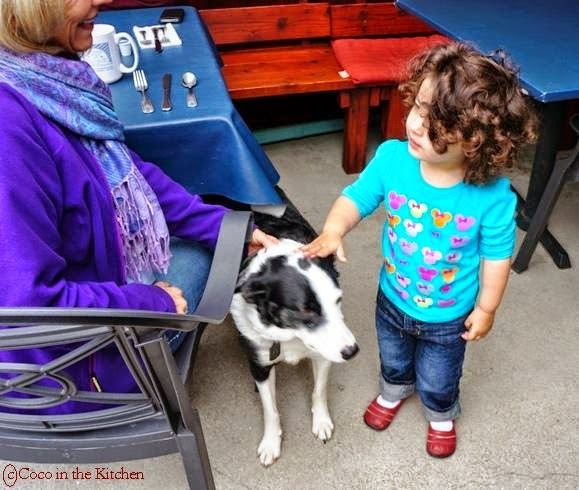 We always stay at our favorite inn with balconies that overlook rolling hills and a creek. If you’re lucky, you’ll catch a glimpse of a doe passing through with her spotty fawns. At night, the sound of frogs gribbiting below is a reminder of summertime. Digging for moonstones at the beach is a favourite activity among visitors, but a few of us are more impressed with the colourful beach pebbles, instead. It’s a fairy-tale world so different from our daily lives. Toss me into this sleepy town nestled among green hills dotted with happy cows and I’ll have no problem chilling out. It helps that there are lots of shops featuring local art and antiques. Treasure-hunting is a family activity. We girls love rummaging through all the rusty, dusty crap to find that hard-to-find piece to add to our collection at home. Breakfast one morning was at a busy li’l unassuming diner with a cute back patio. Even Milou got to go! He lay patiently under my chair, waiting for scraps to fall. There was an old copper tea pot hanging from a tree branch with brass cutlery jingling from its bottom. Maybe I was high on the clean, sea air, but suddenly, I got the urge to DIY it with power tools and decided I’d make my own the minute we got home. It was so nice to just sit for a change and chat with my family. The clock seemed to slow down, too. There was plenty of time for anything and everything. When our hostess Flo came, I asked her about the Apricot French Toast, which sounded a bit suspicious to me because it was made with sourdough. “It’s my favorite thing on the menu. I have to stop myself from ordering it almost every single day,” she tooted. And since she looked like a trustworthy gal, I ordered it. Meanwhile, Daisy had a blast, playing with the water trickling from a pineapple-topped stone fountain near our table. She was completely drenched and the Old Colette would be panicking right about then. But, we were on vacation and life was great. So, we’d make a pit stop after breakfast and put her into dry clothes before hitting the shops again. No big deal. Daisy loved roaming around and introducing herself to people, who didn’t seem to mind the disturbance. She found a nice couple who had a cute dog and made a beeline straight for their table. 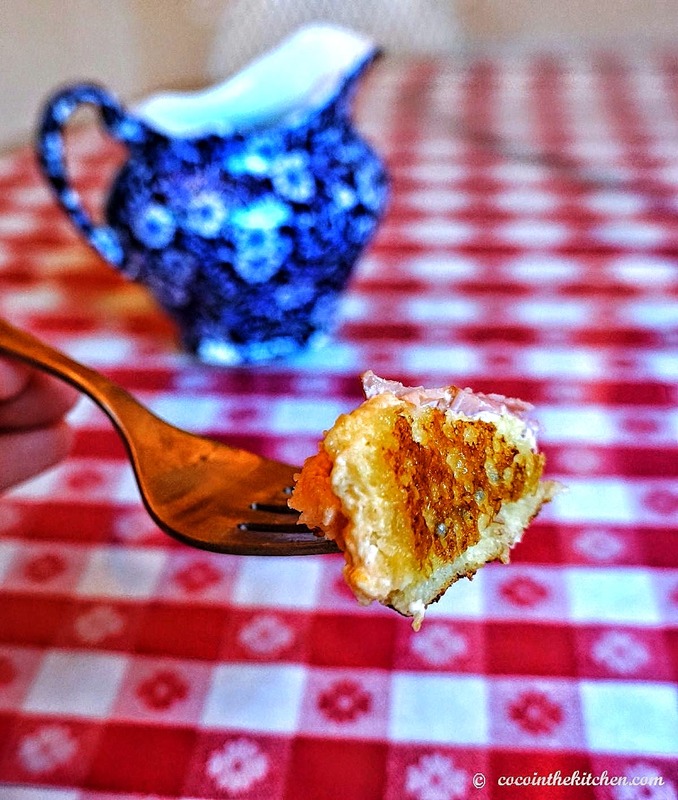 Finally, our food arrived and I couldn’t wait to see what all the buzz was about my sourdough French toast. Ordinarily, I hate sourdough. So this was quite an adventurous feat on my part. After my first bite, I knew exactly what Flo was talking about. It was the best damn French toast I had ever had. I’ve been making it every single weekend since our trip and it’s a hit with the whole family! But, I have a surprise for you. 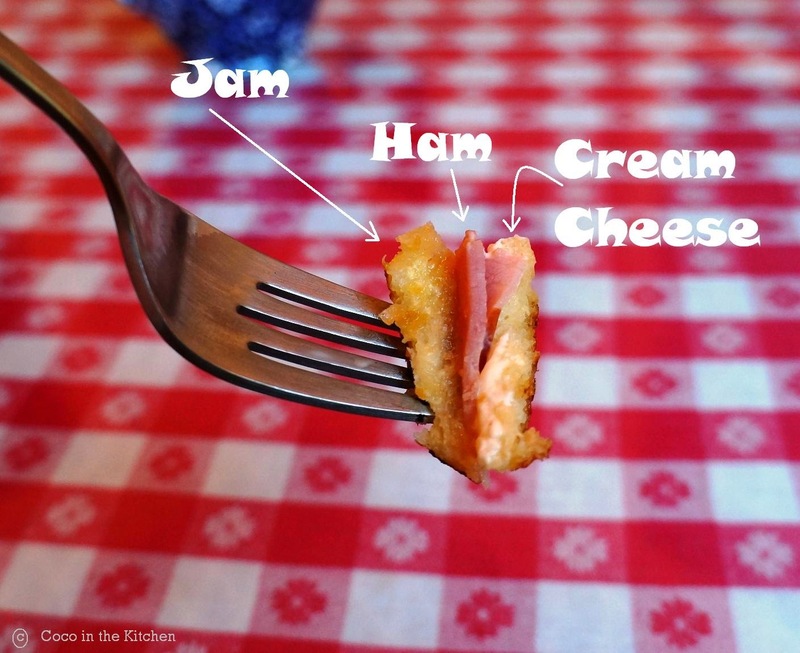 This version kicks it into high gear with a thin slice of smoky Russian ham. 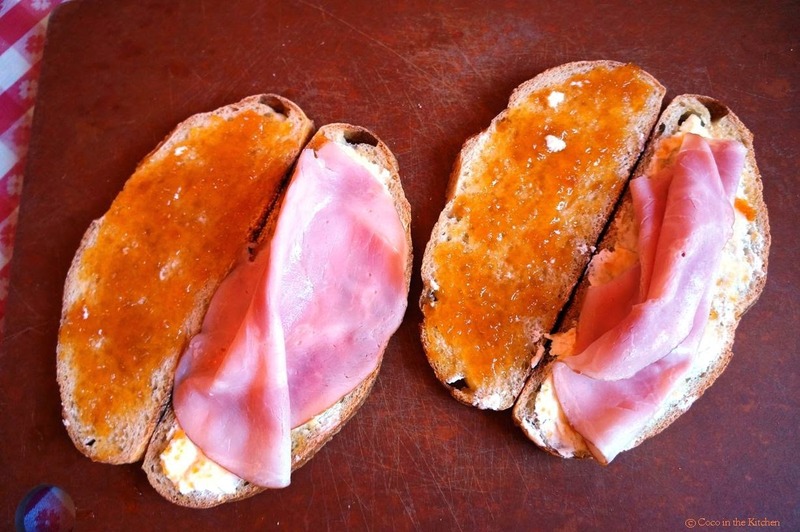 The salty, smoky ham against the sweet apricot jam and the creamy, tart cheese, all dressed in woodsy maple syrup are just gorgeous together. You are going to love the taste. Of all the different types of bread I tested, sourdough is surprisingly the best here. 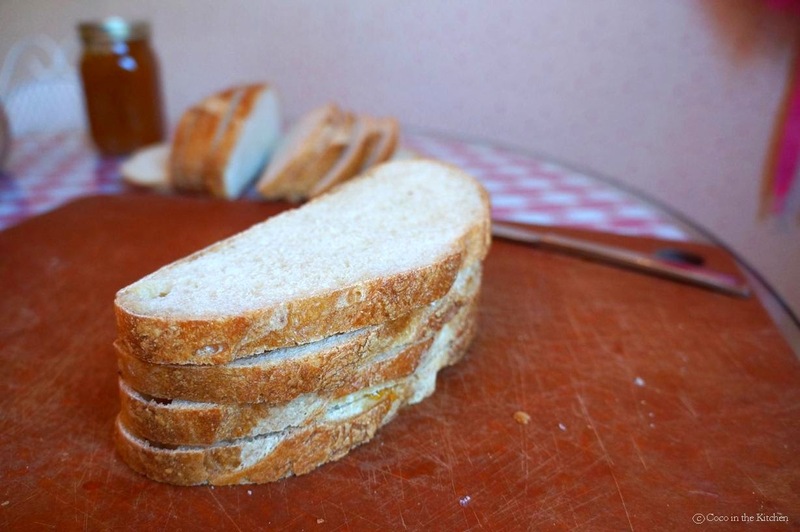 Don’t be afraid to try different types of bread, jams, cheeses. Avoid really soft breads as they’ll fall apart in the egg-milk wash. A heartier bread, like whole wheat, keeps its form nicely. But, this time, I do encourage you to stick to the recipe, because the magic is in the combination here. Make the sandwiches the night before, stack them on top of each other, put them back into the bread bag and let them chill in the fridge til morning. If you’re in a hurry – which you will be once your taste buds have gotten in on the goods – make the sandwiches last-minute and let them chill in the freezer for 5 minutes. Next, make the custard. I like to spike mine with vanilla and freshly grated lemon zest. Dip, dip, then fry ’em up! I’ll give you your money back! Most Middle Eastern and Eastern European delis/grocers carry Russian ham. German blackforest ham would make the perfect substitute, if you can’t find the Russian variety. The ham makes breakfast extra special, but the vegetarian version is just as delicious. 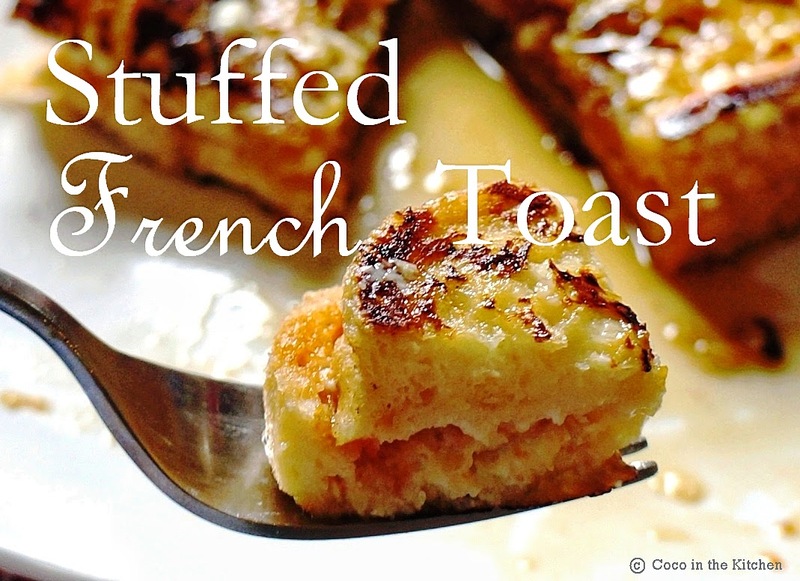 Plan ahead – Make the toast pairs the night before and let it sit in the fridge. The sandwich holds its form better if it’s had time to chill and you’ll have less work to do in the morning. One slice seems like it’s not enough to satisfy a morning appetite, but most sourdough loaves tend to be fairly large and this is richer than traditional French toast. 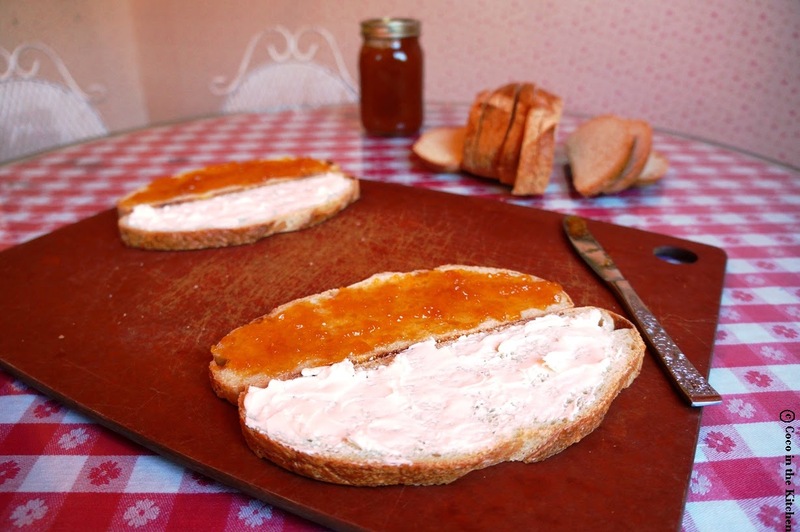 Spread about 1 tablespoon of cream cheese onto a slice of sourdough, then 1 tablespoon of apricot jam onto another slice. Sandwich the two slices together and set aside. Store sandwiches in a plastic bread bag and chill in the fridge overnight or at least 15 minutes. 5 minutes in the freezer if you’re in a hurry to eat! 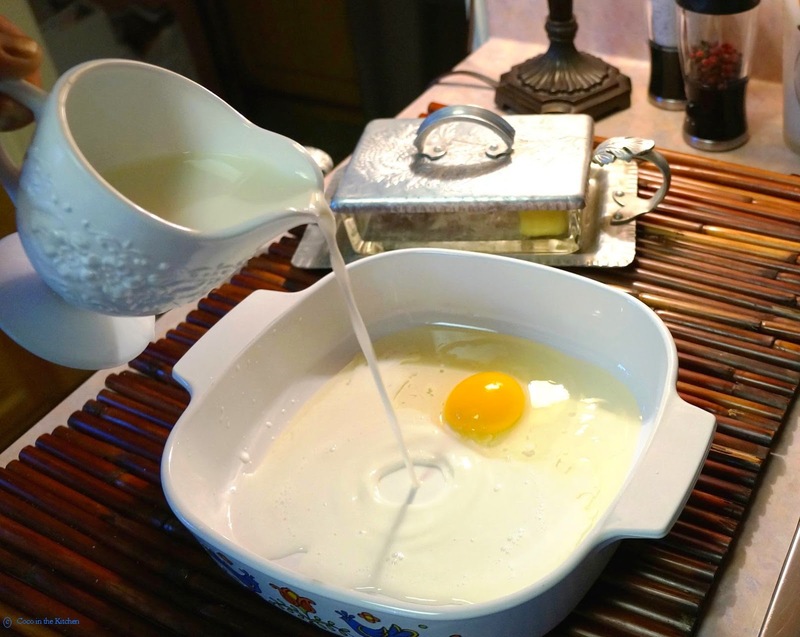 In a shallow dish, beat eggs and combine with milk, vanilla and lemon zest. This is what I call the custard. Add butter to a nonstick pan and heat on medium. Use two pans if all 4 sandwiches will not fit onto one. Remove the sandwiches from the fridge/freezer and remove from the plastic bag. taking care not to splatter any hot butter. Repeat the process and cook the sandwiches 2 minutes on each side. 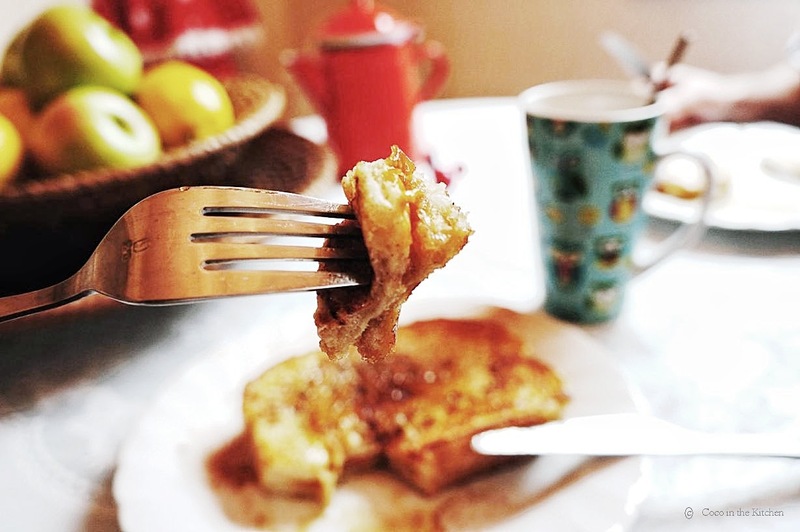 Serve warm with Grade B maple syrup and freshly brewed tea and or coffee. 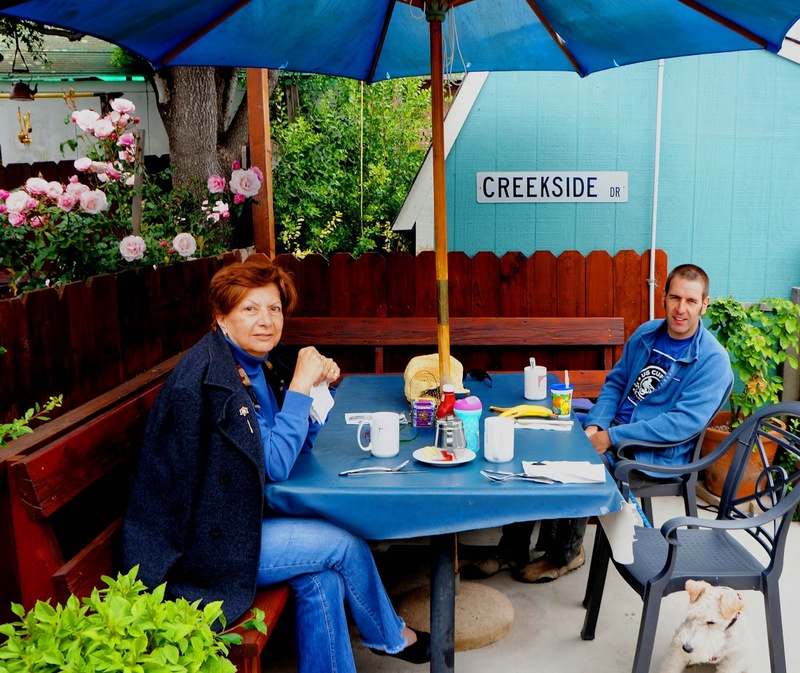 Breakfast on the weekends is a special occasion, like a vacation at home, because it gives us a chance to slow down and be lazy, like we did in Cambria. I dream about wandering around the shops, then stopping for a delicious cappuccino at Lily’s. Next door, there’s a gardening shop where you can get California poppy seeds. In the back of the store, outside, you’ll find lots of pretty pots, garden gnomes, gazing globes, plants and such. The best surprise is the shack with the wavy tin roof called Simplify Me. 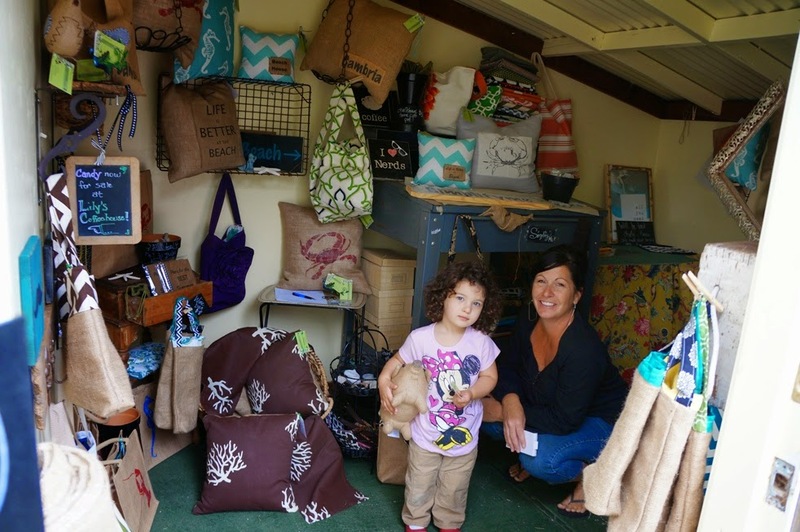 The sweet shop owner, Shara does all the sewing herself. That’s where Daisy found her burlap piggy, which is her new favourite at bedtime. Practicing the fine art of doing absolutely nothing is what defines vacation and Cambria is one of the best places to do just that. Maybe that’s why I’ve been making this French toast every weekend since our trip. Every bite takes me back. How cool is that?! I wish we lived there. Yeh, saw the cushion. Why didn't you buy it, doll? Merci, Susan. Apricots are close to my heart and perfect here. Colette, what a wonderful post about this very special place – it looks fablous, the perfect place for a family vacation. 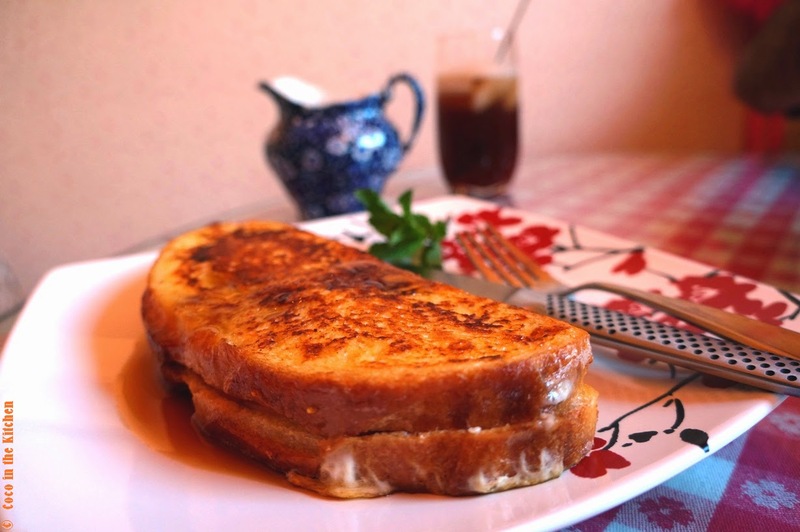 And who does not love French Toast, we all do but I always make the same recipe – now that I have read your raving review, I shall give this lovely recipe a try! P.S. : thank you also for the eagle eye – I have corrected my mistake, that´s what happens when you write blog post at 2 a.m. in the morning! Andrea doll, let me know how you like this one. It's lovely with or without the ham. I'll be making it again this w/end! Oh my God! !These look divine! 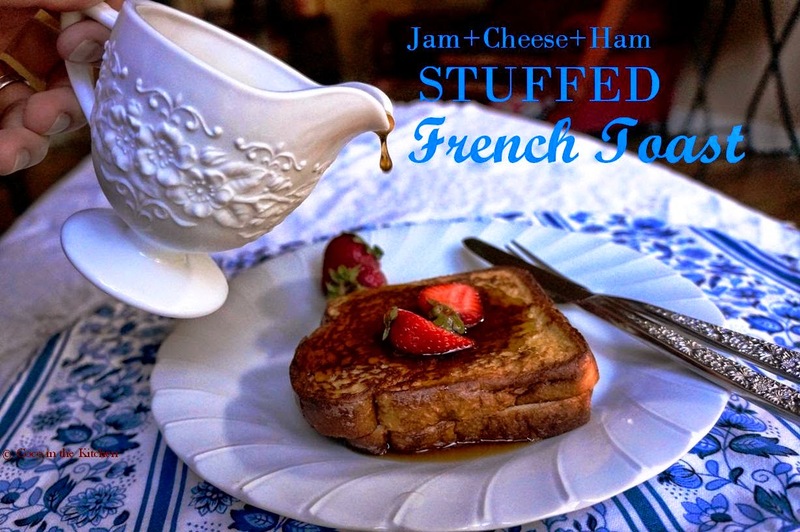 !I love the combo of Ham, Jam and cheese and cannot wait to try this recipe for my family 🙂 So rich and so delicious!! Thanks, Soni. Wait til you TASTE them. The sourdough balances the sweetness perfectly. Let me know if you try it, D! It's the best sound to help you slip into sleep, isn't it? Hi, Shara. We're also glad to have met you. I can't wait til next time we see you and get some more goodies! I freaking love this. It's amazing. Stuffing things is like the best thing ever.